Image, Congressional Pictorial Directory, 107th. Blagojevich, Rod. The Governor. Beverly Hills, Calif.: Phoenix Books, 2009. Brackett, Elizabeth. Pay to Play: How Rod Blagojevich Turned Political Corruption Into a National Sideshow. Chicago, IL: Ivan R. Dee, 2009. Coen, Jeff, and John Chase. 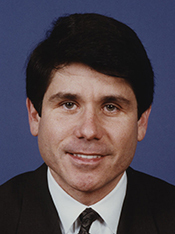 Golden: How Rod Blagojevich Talked Himself Out of the Governors Office and into Prison. Chicago, IL: Chicago Review Press, 2012. Korecki, Natasha. Only in Chicago: How the Rod Blagojevich Scandal Engulfed Illinois and Enthralled the Nation. Evanston, IL: Agate Publishing, 2013.